Ever since the inception of the Amazon FireStick there’s been a dramatic change in TV viewing. The FireStick is transportable and contains all your favorite content, which means you can take your media with you wherever you go. To gain immediate access to your favorite videos you simply plug the FireStick into a compatible TV. An Amazon FireStick is a device about the size of a flash drive that enables content such as YouTube, Netflix, Pandora, Lulu, HBO Go, and others, to be streamed over Wi-Fi to a TV. The FireStick is equipped with a Bluetooth remote; it plugs into the TVs HDMI port and connects via Wi-Fi. Jailbreak can be described as changing a device’s settings to enable the device to access content that is otherwise restricted. Basically, jailbreak manipulates software to allow access to third-party software. So, when you jailbreak an Amazon FireStick you’ll be able to access a huge variety of streaming Internet content. If you own an Amazon FireStick that’s not jailbroken, you’ve probably already noticed that there’s a very limited range of viewing content. And while some people may be happy with this limitation, most users are not, so they either purchase a FireStick that’s already undergone the process of jailbreak or alternatively they jailbreak their own FireStick. Is it Legal to Jailbreak? Many people are confused about the legality of FireStick jailbreak, but the truth is that it’s actually 100% legal. The real issue is how you use the device and whether you’re infringing copyright; meaning that when someone infringes upon another person’s copyright then jailbreak becomes illegal. In fact, the only difference between a normal FireStick and a jailbroken FireStick is the installation of Kodi. Kodi is a TV streaming app; a free, open source software that’s been designed specifically for home entertainment – for lovers of TV films and shows, sports, and movies. It was, in fact, originally called XBox Media Centre and was developed the Microsoft Xbox, but Kodi has been continuously upgraded and modified by many coders around the globe. Developed in year 2003, users of Kodi can now customize by using completely-free builds and add-ons. Kodi works on laptops and smart phones, and it works on the Amazon Fire TV Stick. What Do I Gain by Jailbreaking My Amazon FireStick? It’s true that traditional television has received a major blow by the introduction of the Amazon FireStick, but there’s one major problem. Most owners of an Amazon FireStick are unable to fully enjoy their new device because, even though Amazon Prime Video, Netflix, Hotstar, and others, offer quite a wide range of multimedia content, it’s not all free, and a lot of it is not even globally available. This means that users are being forced to spend even more money to fully enjoy their Amazon FireStick. That’s where jailbreak comes in! Even though the very word “jailbreak” sounds ominous, it’s actually not illegal. However, it does become illegal if you started streaming pirated content, which has always been illegal. So, let us assure you, it’s your Amazon Fire TV Stick and you’re allowed to do whatever you wish. What you will gain from jailbreaking the Amazon FireStick is access to an enormous range of content, at no cost! DRM stands for Digital Rights Management, and DRM software is a security layer installed on many tablets, smartphones, and android devices such as the Amazon FireStick. While DRM software has been installed on devices for so-called security reasons, the real drawback of this software is that it ensures devices are only able to run very limited software. The process of hacking the device is known as ‘jailbreak’, which bypasses the restrictions placed by the DRM software and allows you to install and/or run unauthorized applications and/or software. For more tech-savvy readers, jailbreaking an Amazon FireStick means that a modified set of kernel Patch is being installed allowing you to run unsigned code to the FireStick. Jailbreak also means you’ll be able to make other tweaks to your FireStick. And, it means you’ll have root-level access to your device, which is not normally available without jailbreak. It’s not very difficult jailbreak an Amazon FireStick, and you’ve probably seen many jailbroken Amazon Fire Sticks for sale on the Internet. However, it’s not our recommendation that you purchase a jailbroken FireStick, simply because it’s a process that you can learn to do yourself without having to spend more money. Below we’ll outline the step-by-step process of how to jailbreak your own Amazon FireStick, and for our example we’ll use a 2nd-generation FireStick with Alexa voice remote. And further down we’ll guide you on how to use your jailbroken Amazon FireStick. In order to facilitate the hacking process, we’ll start by doing some tweaks on your FireStick, and the bonus is that no computer is needed to hack a FireStick. The process is actually quite simple and all that’s required is an active Internet connection, the FireStick, and the remote. The next step is to navigate again to Settings and select Applications. Find ‘Collect App Usage Data’ and turn it OFF. 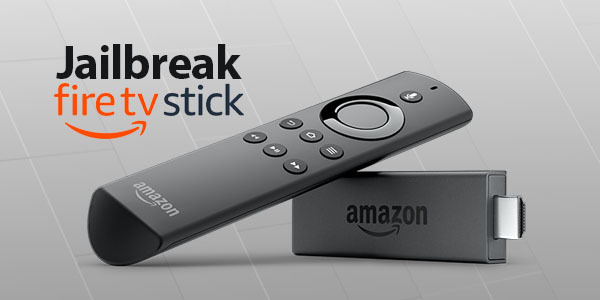 The Amazon FireStick is now ready to be unlocked. We’ll now move on to the second step. You’ll need ES Explorer for jailbreaking the Amazon FireStick and also to run Kodi. ES File Explorer can be downloaded and installed on the FireStick similar to other applications, and it’s absolutely free! Once ES File Explorer has been installed on your device, simply start using it by clicking the “Open” button. The final step in unlocking the Amazon FireStick is to install Kodi. Kodi opens your FireStick up to a world of free multimedia content. Always keep in mind, though, that if the content is pirated or prohibited in your region, it’s illegal! There are a number of ways of installing Kodi on an Amazon FireStick; however, for our example we’ll use the simplest and most basic method, which is to use ES file Explorer. Congratulations! You’ve now jailbroken the Amazon FireStick! The next step is to click on “Open” and you’ll be looking at the Kodi home-screen. Initially, the app may take some time to open, but that’s perfectly normal so don’t worry. So now you have Kodi installed on the Amazon FireStick, giving you easy and free access to a wide world of multimedia content.